Dishonored 2 includes the historical analogue of hacking by figuring out where someone jotted down their password. Throughout Dishonored 2 you can fill your boots with loot, allowing you to purchase upgrades, consumables and ammo at your leisure. The best loot is found inside combination safes. This is where the characters of Dishonored 2 hide their most valuable treasures and their heretical runes and bonecharms. It’s almost worth cracking them open. But how? Safes are impervious to powers and sword bashing, and nobody has time to sit there trying every possible combination. Luckily, the solution to each safe combination is almost always very close by – it’s one of Dishonored 2’s most charming aspects. Can you work out where the absent-minded residents wrote down their combinations? It’s really fun to work these puzzles out on your own so we hope you’ll have a bash before you read on. But if not, here are all the safe combinations we’ve found in Dishonored 2 so far. Note that safe combinations are randomly generated each playthrough – so you’ll have to chase down the clues we list. Our answers won’t help you. The combination is written on the empty frame you expose when you take Painting: The Obtuse Arguments of Lady Boyle. Collect Document: Strictures to Keep You Safe from the large table on the same floor, then cross reference with Book: The Seven Strictures, which is right by the safe. The Mission Clues section of the Journal menu will work it out automatically for you once you have read the document and the book. The combination is on a document in the cash register at the front of the shop. The combination is on a document called Safe Combination on a desk near the doors between the room with the safe and the rest of the main lobby area. Get the combination by speaking with Vasco or looting his corpse for his farewell letter. Two of the three numbers of the combination are written on a nearby blackboard. Spin the third dial until the door opens. The combination is on a document on sale at the Black Market Shop. You can rob the shop to get it for free, but don’t do that till you finish the shopkeeper’s side mission! Loot for: We forgot to go back and collect it! Not a safe per se but still a worthy puzzle. Break into the room above the Black Market Shop by visiting the back alley to shoot the boards off the door. Inside look for Document: Wedding Silvergraph and note the month name. Cross reference with a calendar on the wall, and note the month number and the circled date. The date is the door combination in MDD or MMD format – so Month of Rain 13 is 413, for example. Loot for: Black Market goodies and special action. This safe is well hidden; see our walkthrough for directions. When you find it, open the furnace doors and throw in the body of the dead hound. Press the button and wait until the doors open again. This clears the bloodfly infestation, but the safe has been looted – meaning the correct combination is displayed on the fallen door. Return to the past to enter it and get your loot. Take the document in the gazebo where Stilton is pacing in the past timeline. Alternately, choke him out and return to the altered present to break in, since he takes the lock out. Again, not a safe, but a combination lock. Look for Document: Gate Code on the bottom floor of Winslow’s Safes nearby. Look for a silvergraph (photo) on the wall above the desk in the apartment; zoom in to read the combination on the photo. Look for Document: First Captain’s Safe on the corner desk in the duke’s office, on the fourth floor. 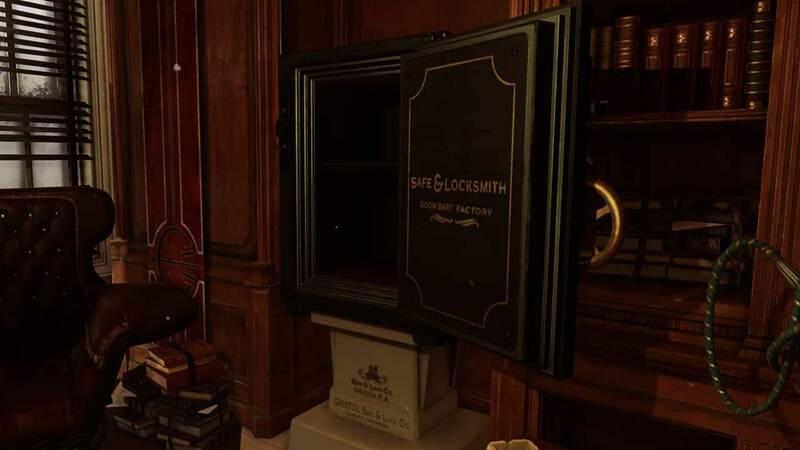 You can rob Dr Galvani for a second time if you revisit his lab on your return to Dunwall Streets. The combination is the same as last time; if you’ve forgotten, check the empty picture frame. That seems to be it for safe combinations in Dishonored 2. If you see one we missed, let us know.